The "Children's Self-Esteem" Book and tape set offers a wonderful imaginatve journey of acceptance, trust and unconditional love. The Children's 'Wish-full' tape, combined with the book "Merinda and the Magic Mirror", makes the perfect set for your son, daughter, grandchild, niece or nephew. 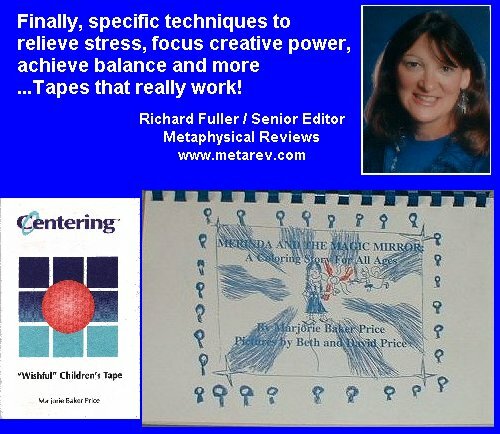 Both the tape and the book provide wonderfully interactive experiences of self-discovery and empowerment. Your journey begins with "Merinda and the Magic Mirror", a coloring story for all ages by Marjorie Baker Price illustrated by her daughter Beth and son David. "Merinda and the Magic Mirror" a joyful, simple fable which follows the path of a little girl and her own magic. In the midst of her busy life, full of does and dont's from all the significant people around her, she discovers a treasure she didn't know she had--Her Self. For children, this is a powerful reaffirmation of who and what they are. The "Children's Wish-Full Tape" is especially designed for children ages five through twelve. Children find that listening to it helps them release everday tensions. Marjorie's soothing visualization helps to enhance their ability to trust by connecting them to their own internal center of control and safety. Marjorie Baker Price is an RN, and author of the nationally acclaimed Centering Tools book and tape series for emotional, spiritual, and physical balance and well-being. She can help you build a foundation for personal power. Any questions please contact me at Marjorie@centeringtools.com.